Michael Phelps needs to clear the air — because there's a cloud of suspicion hanging over him. Some say his future looks a little hazy. OK, enough with the smoking puns. One of the greatest Olympic athletes in history is competing in the Charlotte UltraSwim, being held May 14-17 at the Mecklenburg County Aquatic Center in Uptown. And to say that all eyes will be on Phelps is not only cliché, but it's also an understatement. Most of you have likely seen the now-infamous photo that surfaced in early February of Phelps smoking marijuana from a bong at a party on the campus of the University of South Carolina. He immediately released a statement apologizing for his behavior and while several of his sponsors stood by him, USA Swimming, the sport's national governing body, suspended him for three months. Phelps' suspension ended May 5 (Cinco de Mayo! ), and so the Charlotte UltraSwim is his first official competition since being reinstated; and it's also his first since winning a record-breaking eight gold medals at last summer's Olympic Games in Beijing. Fans, coaches and other swimmers are anxious to see what Phelps will look like when he hits the water. The anticipation is so palpable that the Charlotte UltraSwim will be televised live for the first time ever -- Universal Sports (NBC's Olympic sports network) will broadcast the competition, while Swimnetwork.com will stream it online in real-time. "All of swimming in the U.S. is excited about this event," says David Marsh, CEO and director of coaching for SwimMAC Carolina, the Charlotte-based swim club that's hosted the UltraSwim competition for the last 25 years. "Outside of an Olympic trials, this event has drawn some major national and international attention, especially considering this isn't an Olympic year." All of this attention bodes well for Charlotte's reputation as a sports city, and is particularly great for SwimMAC, one of the most successful USA Swimming competitive swim clubs in the country. In fact, for the past two years SwimMAC has been developing its Elite program, in which it recruits post-collegiate swimmers to come to Charlotte to train. This is one of the programs instituted by Marsh when he took over the club in 2007. Cullen Jones and Mark Gangloff, two swimmers who'll be competing in the UltraSwim, moved to Charlotte to train with Marsh. Gangloff, an Olympic gold medalist, first swam for Marsh at Auburn University, where Marsh was head coach of the men and women's swim teams for 17 years, leading them to a combined 12 NCAA championships. Jones, a New York native and North Carolina State graduate, moved to Charlotte last spring, made the summer Olympic 4x100-meter freestyle relay team with Phelps and captured a gold medal, becoming only the second African-American to do so in the sport. Since Charlotte will be a world stage for four days, Marsh is trying to build one -- literally. "Ticket prices have gone way up, but unfortunately we're spending most of that on the setup of the pool to make sure it meets the caliber of this event," he says. "We're bringing in special staging. Our downtown facility is at a minimum, so we're going to dress it up." While Marsh says they're seeing increased ticket sales and sponsorship for the event, the number of swimmers competing is slightly down this year, but that just means they're better athletes. "The number of athletes competing this year has decreased because we made the time standards lower," he says. "All the athletes will be national caliber swimmers." He says there are approximately 550 athletes competing, about 40 of whom are with SwimMAC, and about 50 to 60 total who have ties locally. One of them is Ricky Berens. The 21-year-old Charlotte native, who grew up swimming for SwimMAC and graduated from South Mecklenburg High School, will be competing this weekend ... after school lets out. "I'll be there Saturday because I have a final [exam] on Friday," says Berens, a student and member of the swim team at the University of Texas. "I'll be able to focus. Swimming for me is a release from everything -- everything stays behind when I'm in the pool." Berens says he's excited to swim in front of the home crowd and hopes "they remember who I am." He also says he's looking forward to seeing Phelps, with whom he won gold on the 4x200-meter freestyle relay team at last summer's Olympics. "I haven't talked to Michael in a while, but after the [smoking incident] I sent him a quick message wishing him good luck. I know he's been training hard, and I think he'll be ready. After Beijing, I don't know if he expected all of the paparazzi and cameras following him. He definitely made a mistake, but I don't think he'll ever do it again." Marsh is also confident Phelps will bounce back and says that his presence at the event means all of the swimmers will be bringing their A-game. "Everybody likes to compete against the best and Michael is certainly the best. He's the best there's ever been. It adds to the competitors' attitudes. We have to make lemonade out of lemons for his situation. We've been lucky that this ended up being his first competition back." 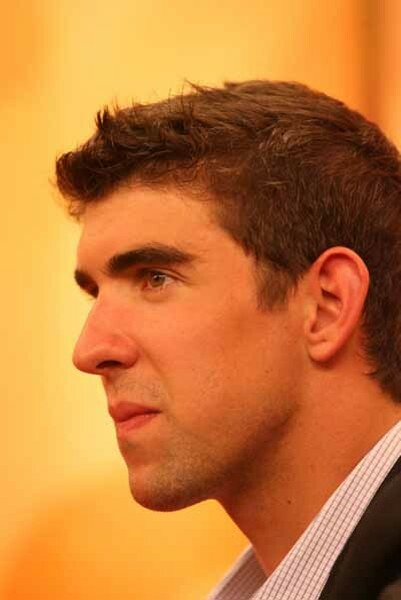 Phelps, who's competed in the Charlotte UltraSwim in past years -- before he was the superstar he is today -- is scheduled to compete in the 50-meter freestyle, 100 free, 200 free, 100 backstroke, and 200 butterfly. You can get more details on the competition and schedule, including info on a free clinic being hosted by SwimMAC, by visiting www.charlotteultraswim.com.